Erik Vergel-Tovar is a recipient of the 2014 Lee Schipper Memorial Scholarship. His research examines the relationship between transit-oriented development (TOD) and bud rapid transit (BRT) to challenge the conventional notion that density is all you need to create successful BRT systems. Photo via Erik Vergel-Tovar. Erik Vergel-Tovar, no stranger to TheCityFix, is a PhD candidate in the Department of City and Regional Planning at the University of North Carolina at Chapel Hill, where he researches the rich relationship between bus rapid transit (BRT) – a mass transport solution now employed in over 180 cities – and the built environment. His work as a recipient of the 2014 Lee Schipper Memorial Scholarship will focus on the importance of the built environment for travel behavior in BRT systems worldwide. 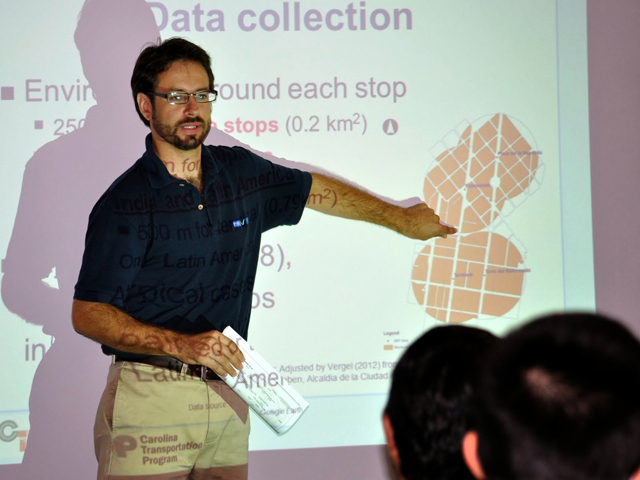 Drawing from data collected at BRT stops in seven Latin American cities, he will provide recommendations for which measures contribute to successful BRT systems. TheCityFix sat down with Erik to learn more about his interest in urban mobility and get his take on why delving deeper into the relationship between transit-oriented development (TOD) features and ridership can promote and improve sustainable transport systems like BRT. Tell us about yourself! Where are you from? What kind of transport did you use growing up? I was born and raised in Bogotá, Colombia and I relied on public transport. When I was in high school, I would commute on city buses from the time I was 14 years old. Thanks to that, I learned a lot about Bogotá. In fact, some of my classmates and relatives would ask me about the best way to get to different destinations on public transport, and this was before the TransMilenio. Even nowadays I don’t own a car. Since my graduate studies in the Netherlands, I started to bike for commuting as well as for fun. Bogotá is well recognized for its innovations in sustainable transport. What was it like to live in a city known for leadership in sustainable urban mobility? During the 1990s, public transport in Bogotá was actually a huge challenge. In my lifetime, I’ve seen the city’s transformation. When I was studying architecture and urbanism in Bogotá in 1999, we saw a lot of interest in the introduction of the TransMilenio system, and with it the renovation of public spaces – like sidewalks becoming spaces for pedestrians and the construction of an extensive network of bike paths for the first time in the city. The transformation also included the construction of high-quality architectural facilities like public libraries. First, there were big finance problems, which Mayor Jaime Castro was able to address during his administration, and then it was possible to get more international finance for Bogotá. After him, Mayor Antanas Mockus implemented what he called the “citizenship culture,” with the idea to change people’s behavior by understanding the idea of taking care of public spaces and having a sense of belonging for the city. These were the transformations we were seeing, and then Mayor Enrique Peñalosa introduced the infrastructure: the BRT and other things Bogotá is known for today. It was very interesting for me to watch that whole process, considering that, during the 1990s Bogotá was, I think, a city in crisis. How did you first become interested in the relationship between sustainable transport and the built environment? As I saw the urban transformation of Bogotá by the end of the 1990s, I always wondered how exactly the introduction of the TransMilenio contributed to this. And not only how the BRT affected the transformation of the urban space and land use, but also to what extent the city itself was shaping the way the BRT was built, designed, and implemented. After obtaining a Fulbright scholarship, I applied to schools in the United States where I could conduct research on the relationship between the built environment and transport. I was fortunate to get in at UNC-CH and thus to have the opportunity to work with Professor Daniel Rodriguez, who has been working on this topic for several years. My research now is really about how this relationship between transport and urban development works in practice, and the implications for people, for investment in transport, for cities, and for decision-makers. Your research challenges some widely held beliefs about what makes bus rapid transit (BRT) systems successful. Tell us more about that. My research looks at how the built environment around transit stops affects ridership. The conventional assumption is that high population densities and high-rise developments in close proximity to BRT imply higher levels of ridership. There are many cities in the world currently trying to attain this urban form, based on the remarkable example of Curitiba, Brazil. When you visit Curitiba, and you take a look at the BRT, you see that there are high-rise developments along the corridors, there is high population density along the corridors, but there are some important aspects of transit-oriented development (TOD) that are missing. For instance, based on built environment data collected around BRT stops in Curitiba, my advisor and I found a surprising amount of parking space near BRT stops, with less pedestrian infrastructure than expected with the exception of downtown. Curitiba is one of the fastest motorizing cities in Brazil, so this makes you question if population density and high-rise developments in Curitiba really have something to do with BRT ridership. In fact, we have already found some negative associations between population density and BRT ridership in a sample of BRT stops in Curitiba, and I am interested in testing this relationship in other cities in Latin America. The challenge now is to determine what role population density and other built environment factors really play in making BRT systems successful. This research focuses on the joint impact of built environment variables, in addition to population density, and TOD features on BRT ridership to determine mechanisms to make BRT successful. What does a city built for people look like to you? A city built for people is a city where people meet and interact through the enjoyment and use of public space. Public spaces are the places where people from different socioeconomic backgrounds can meet and interact, and public transport is the place where you can interact with different people who you would never meet or have any type of interaction with if you were driving a car on your own. Another aspect is equity. We know urbanization expands access to education, healthcare, and even can more efficiently address poverty reduction; however, nowadays not everyone in urban areas has the same level of access to the benefits urbanization offers. In cities for people, everyone is truly a citizen and thus should have the same rights and equal access to the same opportunities as other citizens do. The Lee Schipper Memorial Scholarship honors the legacy of Dr. Lee Schipper, an internationally recognized physicist and researcher who co-founded EMBARQ, the producer of TheCityFix, in 2002. The scholarship supports up to two extraordinary young innovators advancing transformative research in sustainable transport. Learn more at leeschipper.embarq.org.